Synthetic diamond marquise flower shaped earring jackets featuring round brilliant diamonds arranged in a trio of open marquise shapes. Available options: platinum, 14k or 18k gold: white, yellow, rose. 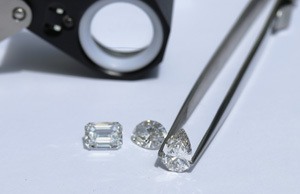 Each piece of Ada Diamonds jewelry is custom made to order by award winning fabricators in the USA. Sustainable, eco-friendly, conflict free, and affordable. Ada Diamonds Design Description- These delightfully unique earring jackets feature round brilliant lab grown diamonds arranged in a trio of open marquise shapes. Available in 14k white, yellow or rose gold. Pairs well with Ada's Open Marquise Studs. Additional Description- These gorgeous jackets can fit multiple ear lengths and are meant to be worn behind the ear lobe.